I've fallen in love too many times this year. With each new destination, new country or new town that we discovered, yet another piece of my heart was stolen. Our recent trip to Italy's Cinque Terre was no different - except that Cupid's arrow didn't just strike me once; it struck me five times. One for every of Cinque Terre's five towns; each with their own charm and character, but all that wooed me and had me head over heels in an instant. As the European summer drew to a close, we spent four days exploring this famous stretch of Italian coastline. 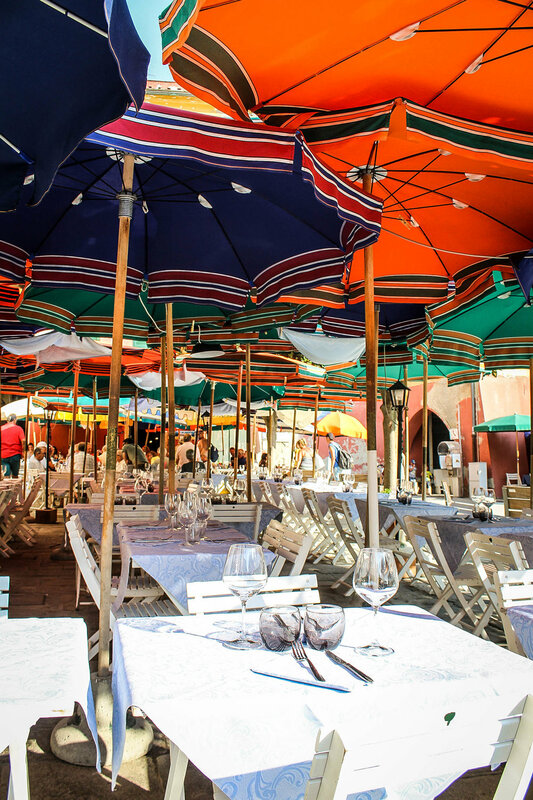 One doesn't need to say much more than 'Italian Riviera' to conjure up magical scenes of charming seaside villages and beaches where a sea of brightly-coloured umbrellas merges with the crystal clear Mediterranean Sea. And that was exactly what we were greeted with once we stepped off the train from La Spezia. Over our four days in Cinque Terre, we explored all five of the quaint towns that were tucked into the coastline's cliff face. While the renowned way to travel Cinque Terre was via the walking trails that connected all five, the partly closed coastal walk had us opt for a three-minute train ride between each town - less scenic but quicker, and it just meant more time getting up close and personal with each town from within rather than from above - my kind of exercise! See below for teasers and tips from each beautiful little town, see the bottom of the post for travel tips, and see you in Cinque Terre next summer. NOTE: The towns are not listed below in our order of preference or their geographical order, simply the order in which we explored them. Vernazza - the town we called home for those four days - was our favourite of the five. But ask that question to anyone who has been to Cinque Terre and their favourite is bound to be the one that they stayed in and got to know the most intimately. It was the perfect blend of everything that Cinque Terre is - it boasts the feeling and charm of a true little village, mazes of back streets that are amazing to get lost in, and that lead out to a harbour-front town square, a small beach and a dock perfect for long days perched on the rocks and watching the most incredible sunsets. Because these small towns are a Tetris of apartments tucked into the cliffs, AirBnB is the way to go. This isn't the location where you want a modern, minimal hotel room (and finding one of those is few and far between, not to mention expensive); the best accommodation is a room that's as full of the Italian charm and character as the town itself. Lots of options are available on AirBnB but get in quick; there are only so many rooms but oh so many people trying to visit this part of the world. Nothing beats dining on fresh Italian pasta and carafes of red while sitting on the edge of the Mediterranean - exactly why Baia Saracena became our favourite dinner spot. Amazing food, a beautiful house red wine, reasonable prices but with a million dollar view. We had to force ourselves not to eat there every night! The perfect cafe those of us whose dietary preferences differ to the typical Italian diet. The only place we found Soy milk for our morning coffees (thank God! ), great vegetarian options, and breakfast dishes for those wanting a little more than a coffee & croissant duo. 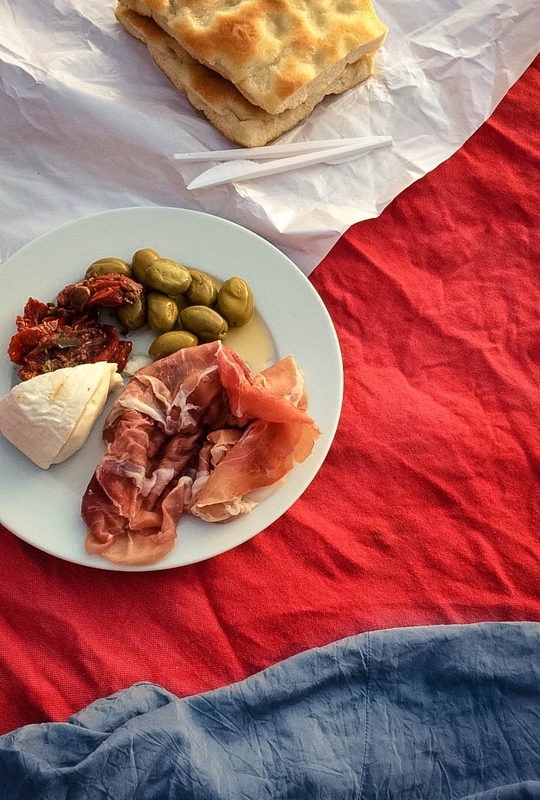 Our best meals were those we put together ourselves after a visit to a local delicatessen: fresh ingredients, combined together in a fresh sandwich or antipasto that we could feast on wherever we were- at the top of the hill, sunbathing on the rocks etc. But shop around; the best delis are the ones that the locals frequent (better selections and better prices). Unfortunately we didn't eat here but we wished we did every time we walked past. Perched up on a fort towering over the harbour, Belforte is a restaurant with a view to die for (but of course that means a higher price tag). It's got a reputation for being the only restaurant in Vernazza that you need to book in advance so make sure you do so. Instead of squeezing onto an inch of the beach, find yourself a big flat rock at the edge of the harbour for the day. It's the perfect spot for sunbathing, to jump into the sea when you need to cool off and you feel like you've got the bay all to yourself. Climbed to the top of Castello Doria (the Castle and tower of Vernazza) for a panoramic view of the coast. We tried twice but failed to take note of the opening hours and then the entrance fee (it opens at 10am each morning and costs €2). One of the things we've been missing most since living in London is the ability to easily get to a beach so it was non-negotiable to spend a day lying horizontally with a brightly coloured umbrella above us and sand beneath us. 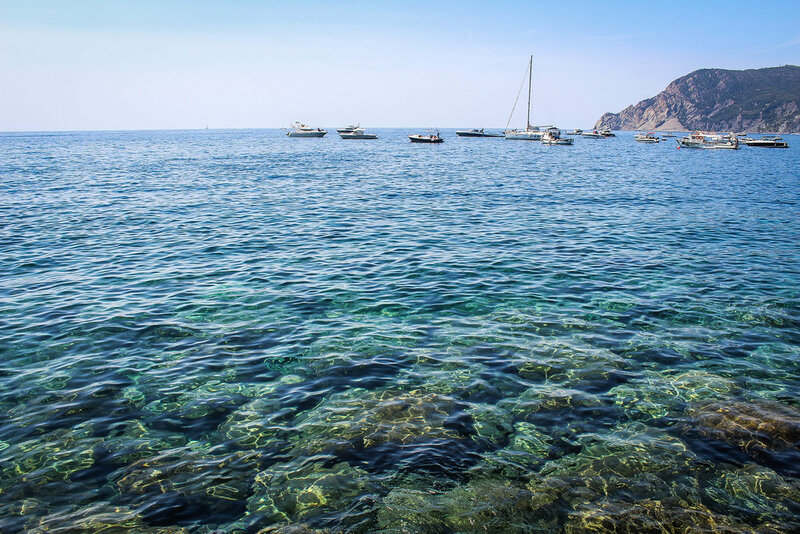 If this sounds like your idea of bliss, set aside a day for Monterosso; the only of Cinque Terre's five towns that has a true (although pebbly) beach. 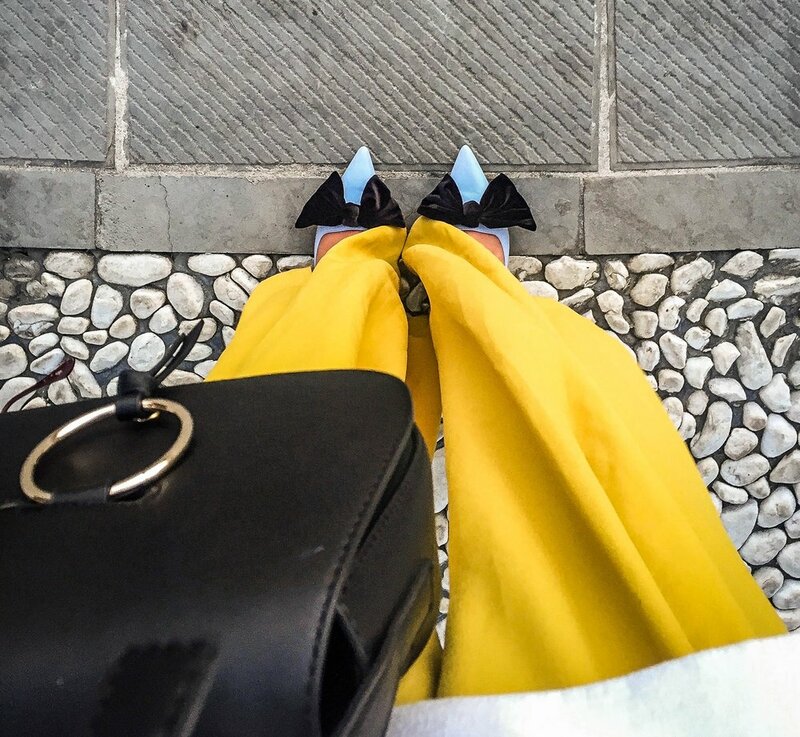 Do yourself a favour and take a pair of jandals with you. In true European style, the beach is rather pebbly (as opposed to sand), which makes for rather sore and sensitive feet after a few trips down to the water. 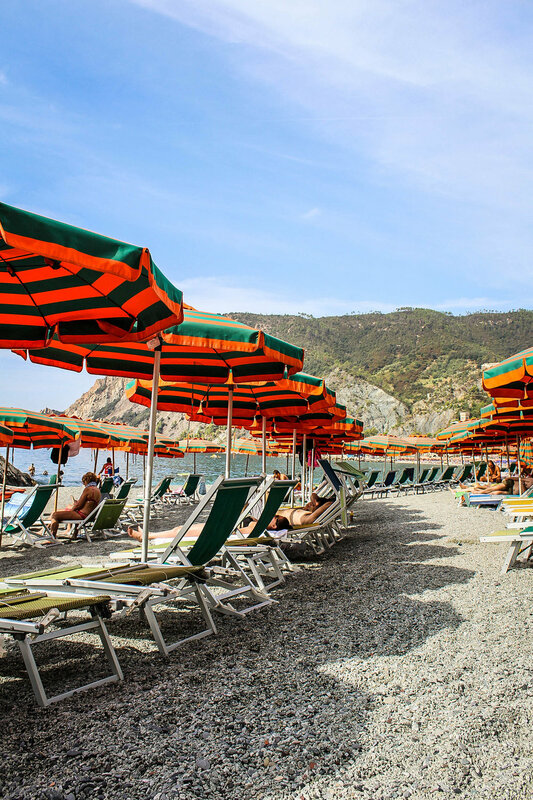 It would be too easy to not move from your lounger at Monterosso Al Mare all day but do that, and you miss half the beauty (and half the town!) of Monterosso. Through the tunnel at the end of the beach you'll find yourself at the edge of the small Monterosso township. 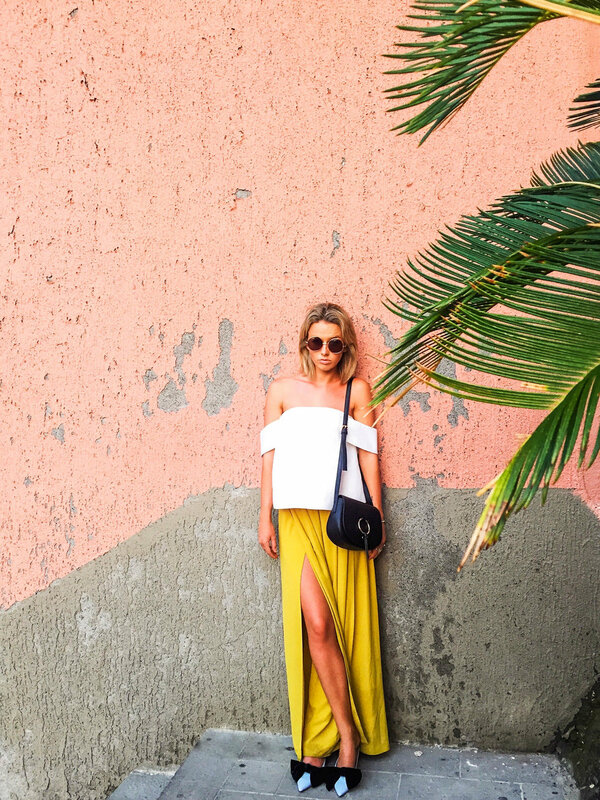 Small yet full of gorgeous boutiques, restaurants and atmosphere; and it also boasts another beach and dock where you can watch the waves and the boats roll in. Leave your towels on your sun lounger at lunchtime and head into the township for some local cuisine and a look around the shops. Walk around the dock to the rocks. There's nothing more peaceful than staring out over the Mediterranean and watching the boats by. We only spent an afternoon in Manarola but that was enough to see why Manarola is often people's favourite of the towns. It's a town that is beyond charming from top to bottom: it boasts the most spectacular views from up top and cascades down to two of the best ways to cool off: the popular slipway and swimming spot at the bottom, or an Aperol Spritz at Cinque Terre's famous Nessun Dorma restaurant. 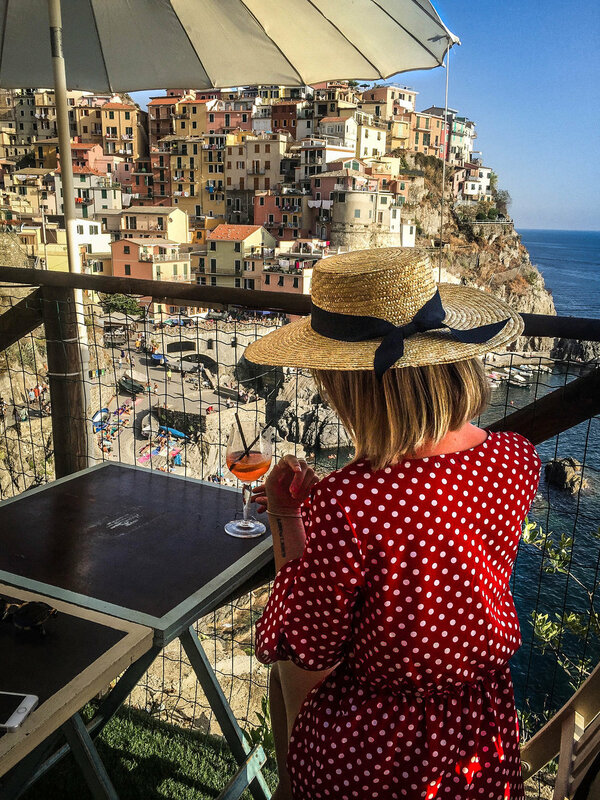 I think it's safe to say that no one visits Cinque Terre without indulging in an Aperol Spritz and the famous Bruschetta at Nessundorma - me included and Instagram would attest to that too. Perched right up on the hill, this beautiful bar not only shows off Manarola from above but gives you an endless view out over the ocean. Prepare to spend a whole afternoon/evening up there - you won't want to leave until the sun and your waistline disappears. I felt like I had already visited Riomaggiore thanks to it being Cinque Terre's posterchild on Instagram. But with the coloured buildings and the most magical sunsets it's hardly surprising. Being the smallest and most crowded of the towns - both with buildings and people - we headed straight for the harbour. Another perfect town to spend a day out on the rocks with the view back towards the charming town on one side and out to endless sea on the other. Climb around the rocks and set up camp for an afternoon in the sun. With the rocks and harbour separating you from the town, you get the most perfect and peaceful vantage point. It's also the perfect spot to enjoy your own private picnic on the water so it's definitely worth a trip to a deli before heading down to the harbour. Stayed around long enough to watch the sun go down. Riomaggiore is famous for being the best place in Cinque Terre to watch those magical Meditarranean sunsets. We said our final farewell to Cinque Terre at Corniglia, our last stop on our way back to Pisa. Perched high up on the peninsula - a decent climb up from the train station and down to the water's edge - we spent our final hours exploring Corniglia's shop-lined lanes and dining on our last taste of fresh gnocchi. I have no doubt there is more to explore of this town but that just gives us yet another reason to go back. I'm not exaggerating when I say it was a decent climb to the top i.e. where the township is. If you choose to go by foot, prepare yourself for a lot of stairs, or catch the mini bus service from behind the train station. Seen more of the coast by sea, either by hiring a boat or a kayak. While looking out over the Mediterranean is postcard perfect, it would have been magical to see the coast from this different perspective. However, make sure you do your homework - there are many people who hire out boats to tourists so ask around and make sure you're getting the best price. Impossible to name. The coast is so picture-perfect that almost everywhere makes for an idyllic backdrop. FLY into Pisa (the easiest and cheapest airport) and catch a train from Pisa Centrale Train Station to La Spezia, and then from La Spezia out to Cinque Terre. The full journey will only take you about 90 minutes all up. CARS rarely exist in Cinque Terre so it's easier not to have one. If you do come in by a car, expect to leave it in a carpark further inland while you explore Cinque Terre. The TRAIN is the best way to go. Each town is only a couple of minutes away by rail so if you plan to explore all five towns it is worth looking into getting a train pass for while you're there. Currently the coastal WALKING trails are closed between Riomaggiore-Manarola-Corniglia so don't expect to be able to walk between all five towns.